William Abbott, labourer, at 20 years and four months of age, attested for service in the Grenadier Guards as Private, 3121, in London on 13th August, 1891. He just scraped in as far as height was concerned (shown as 5ft, 8 and 5/8 inches when the minimum standard for the Guards was five feet and nine inches). Edward Spiers ("The Late Victorian Army") tells us that it was then difficult to find men of the necessary high physical standards for the Foot Guards due sickness and invalidity caused by the severity of sentry duties in London. Our man survived and transferred to the army reserve on 11/8/1898. He was recalled to Army service under Special Army Order of 7/10/1899.His South African service dates from 21/10/1899 to 20/8/1902 with the 3rd bn., Grenadier Guards. "3121 Pte. 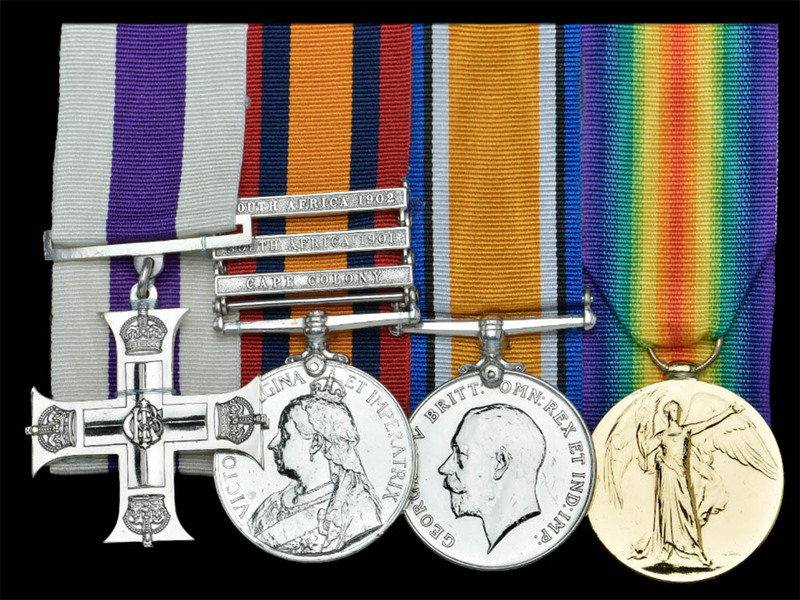 W. Abbott of 3GG was awarded the Queens South Africa medal with the illustrated six clasps and the Kings medal with the usual two date clasps. Stirling ("Our Regiments in South Africa") devotes several pages to the activities of 3GG and readers interested in that Regiment are suitably directed to that source. On return from South Africa, Pte.W. Abbott served on in the reserve (1st Class and Sec.D) and was finally discharged at the termination of his engagement on 8/12/1907. On 15/4/1915, aged 44 years, William Abbott signed up for one years' service in the TF in the 4th Bn., West Yorks Regiment. He had Home service until 4/3/1917 and then Reserve service until 30/4/17 when he was Discharged as "Surplus to Military requirements". After a long and hopefully fruitful life, at the age of seventy-seven years, retired stevedore William Abbott died of natural causes on 3/7/1950 at Easton, County of York, with his married daughter present. What changes in Society he must have seen. The illustrated, mounted pair was spotted on that favourite on-line auction site many years ago now and immediately appeaed to IL. Hopefully others will post examples of QSA/KSA to the Grenadier Guards on this topic. MC London Gazette 4 October 1919.